You can’t deny it: technology has become the centre of the world. We are never too long an eye’s glance away from our phones (I’m definitely guilty of this). As somebody who relies on her phone for pretty much everything, struggles with mild anxiety, and is very big on physical and mental health/well-being, I’ve recently downloaded a bunch of apps on my phone to help me with these areas – it’s pretty much a stock-filled toolkit. The following apps I will be sharing with you are some that I have tested out, or am currently using as a way to better myself… minus a few (because I don’t have enough memory on my phone for everything). Of course, these are just resources and are not to replace – though they are often used in conjunct with – any kind of therapy or treatment in serious situations – please consult a professional should you feel the need to. I’ve divided this post up into several categories: anxiety, general health & fitness, general well-being, meditation/mindfulness, productivity, and relaxing games. MindShift can help people cope with anxiety by changing the way one thinks about it. The app helps people learn how to relax in the midst of anxious thoughts, develop more helpful and effective ways of thinking, and identify active steps to help one take charge of the anxiety. Also included are some meditational/mindfulness tools to chill out. Based on Cognitive Behavioural Therapy (CBT), relaxation, and wellness, Pacifica offers tools to address and manage everyday stress and anxiety, as well as fearful thoughts. Some features include: Daily Mood Tracker, Relaxation and Mindfulness Tracks, Health Tracker, Community Support. MyFitnessPal is one of the best and most popular health and fitness apps out there. With the largest food database (over 6mil foods), the calorie counter will help people manage their weight, diet, and overall health. My favourite feature: finding specific foods using the barcode scanner – it beeps too! Admit it, we’re all sleep-deprived. Sleep as Android is a smart alarm clock (wakes you up in the optimal moment) with sleep cycle tracking. Fall asleep to the gentle sounds of nature; never oversleep with CAPTCHA wake up verification; listen to your sleep-talking (or snoring); and more! “Maximum results with minimal investment.” These 7 Minute Workouts are based on high intensity circuit training (HICT), which is proven to be the “safest, most effective, and most efficient” way to improve your fitness. It only takes 7 minutes of your time (realistically, more like 8-9minutes though). Each workout consists of 12 exercises that are done for 30 seconds, with 10 second breaks in between each – the time can be customizable, don’t worry. Bonus: try the 30 day challenge, available in 3 different levels. 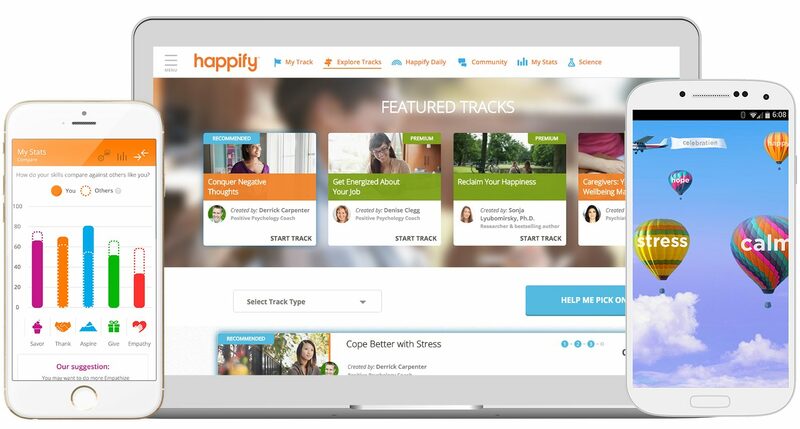 Happify uses techniques developed from interventions in the fields of positive psychology, mindfulness, and CBT as a way to reduce stress, overcome negative thoughts, build greater resilience, and ultimately to live a happier life. Sample tracks include: conquering negative thoughts, coping better with stress, and building self-confidence. If your New Year’s resolution is to journal, but you can’t seem to find anything to write about, this is the app for you. me.time is a diary/journal app that helps you learn more about yourself. Daily prompts/questions challenge you to think deeply about your life. My favourite feature: definitely the sleep stories, those are pretty fun! Headspace uses proven meditation and mindfulness techniques that train your mind for a healthier, happier, and more enjoyable life. Their free Take10 program starts you off with the basics of meditation for 10 minutes a day. 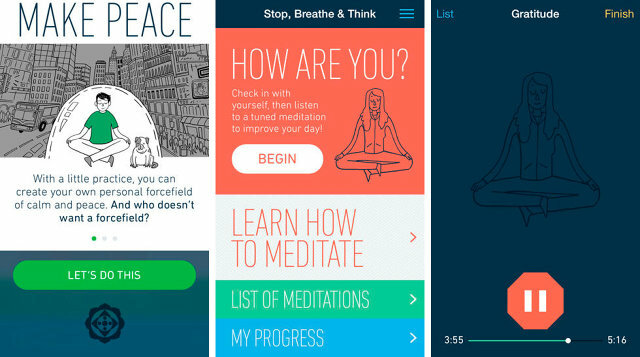 Stop, Breathe & Think is a mindfulness, meditation, and compassion-building app that allows one to relax the body and mind. Guided meditations are available for: self motivation, anxiety and stress, depression, compassion, falling asleep, and more. Blending guided meditation and resilience activities with mood and heart rate tracking, Wildflowers is an immersive and engaging app to help users calm the body and mind. Some features include: heart rate tracking, personalized meditation based on mood, and insights into the relationship between body, mind, and meditation. Increase your energy, get healthy, lose weight, sleep better, and stay motivated with Fabulous, an app designed to instil healthy habits, routines, and happiness in your life. Beat your phone and social media addiction and stay motivated and focused with Forest. Plant a seed, and watch it grow into a tree. The catch? It will wither away should you leave the app to visit a “blacklisted” site (e.g. Facebook, YouTube, etc.). A simple, relaxing, endless game with a goal to clear your mind, and remove the stresses from your daily life. All you have to do is connect all the fragments. My favourite feature: it is what it is – endless, stimulating, calming gameplay. I just love this game! Manipulate impossible architecture and guide a silent princess through a mysteriously stunning world. Filled with optical illusions and minimalist 3D design, Monument Valley is a one-of-a-kind adventure puzzle that will challenge your perception of space. My favourite feature: the graphics! The illusions! Forge new crystals by striking all the sides with Polyforge, another app with a simple gameplay and a beautiful, colourful, minimalistic interface. My favourite feature: the colours! And the music/sound effects. An app that requires focus, concentration, and impeccable timing, you have only 2 goals in Smash Hit: i) to travel as far as you can, and ii) to smash and break everything in your path. Need a moment of peace during your day? Visit your pot in Viridi, a virtual-reality, real-time growing plant game. My favourite feature: plants… what else can I say? Pingback: ringing in the new year – it struck a chord.